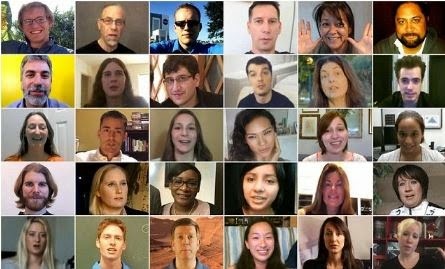 One hundred brave souls from around the globe are now vying for a one-way ticket to Mars, knowing they will never return from the Red Planet. The Dutch-based Mars One project - which aims to send people to live on the faraway planet - has whittled down its shortlist of candidates from more than 200,000 to just 50 men and 50 women, a third of them Americans from all walks of life between the ages of 19 and 60, including married people with children. See their names after cut.. They are: (top row from left) Cody Reeder , Peter Degen-Portnoy, George W. Hatcher, Peter Felgentreff, Kay Radzik Warren, Christopher Patil, (second row, from left) Dan Carey, Cassandra Morphy, Matthew Kliebert, Carl LeCompte, Dr Elena Shateni, Benjamin Alan McLain; (third row, from left) Laura Smith-Velazquez, Oscar Mathews, Laurel Kaye, Sue Ann Pien, Sara Director, Shirelle Erin Webb; (fourth row, from left) Andrew Tunks, Carmen Paul, Kenya Armbrister, Yari Rodriguez, Andrea Stancin, Maggie Duckworth; (fifth row, from left) Kristin Richmond, Ethan Dederick, Michael McDonnell, Yvonne Young, Sonia Van Meter, Mead McCormick.